Looks like the diva is taking her new single’s name, “Born This Way,” to very literal places. 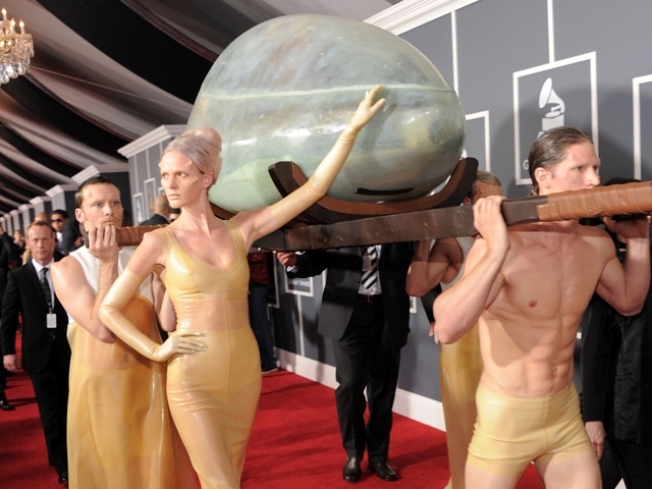 Lady Gaga arrived at the Grammys Sunday night in a giant egg, carried by a posse of physically fit, scantily clad lackeys in golden outfits. “You will not believe your eyes when you see how @ladygaga showed up to the Grammys,” Kelly Osbourne tweeted. The theme of birth and gestation was confirmed by Lady Gaga's Creative Director. “It was necessary to incubate her for a certain amount of time, because she’s birthing a new race,” Laurieann Gibson told CNN on the Red Carpet. The collaboration, according to Gaga's Twitter, is through Lady Gaga's creative team, Haus of Gaga, with Hussein Chalayan and House of Mugler, two prominant fashion houses. Lady Gaga’s single, which dropped earlier this week, has had a mostly warm reception from critics. “Born This Way” will get its live premier at the Grammys. The singer is up for six Grammys, including Album of the Year. Though some fans are undoubtedly disappointed Gaga didn’t show up to the awards show wearing some sort of food, this certainly is an innovative (and less work-intensive) way of working the Red Carpet.